Research has shown that word problem difficulty is influenced by various linguistic, numerical and general variables, but results in this area are inconsistent. 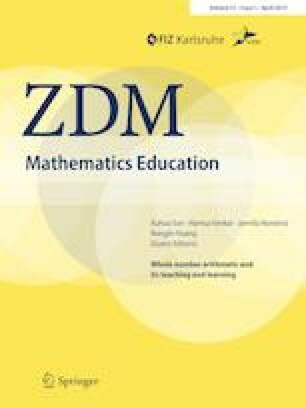 This paper focuses on the question of how the order of numerical data, the context, the position of the unknown transformation, and the length of the statement in an additive word problem, influence the achievement and reasoning of primary pupils. These variables were varied in two word problems requiring additive reasoning and these variants were solved by pupils in Grades 4 and 5 from four Prague primary schools. Item Response Theory was used both for the division of the pupils into four equally able groups each solving a different variant of the word problem, and for the quantitative interpretation of data. The pupils’ solutions were also analysed in a qualitative way. For a complex additive problem with several states and transformations, we noticed a significant influence of the order of data and the position of the unknown transformation on the pupils’ achievement and types of mistakes. No such influence of context (with which the pupils do not have immediate experience) or the length of the text (prolonged by superfluous information) was found. Some implications for teaching mathematics and preparing tests are given. The research was financially supported by GA ČR 16-06134S Context problems as a key to the application and understanding of mathematical concepts. We thank Martin Chvál from the Institute of Research and Development of Education, Faculty of Education, for the statistical evaluation of the data. Reusser, K. (1990). Understanding word arithmetic problem. Linguistic and situational factors. Paper presented at the Annual Meeting of the American Educational Research Association. Boston, MA (April 16–20, 1990). Retrieved from https://files.eric.ed.gov/fulltext/ED326391.pdf.